The Federal Highway Administration (FHWA) research project, Corrosion Resistant Reinforcing for Concrete Components, began in 1993. The objective of the proposed study was to develop cost-effective new breeds of organic, inorganic, ceramic, and metallic coatings, as well as metallic alloys that could be utilized on or as reinforcement for embedment in portland cement concrete. It was required that new coatings and alloys should provide significantly more corrosion-resistant reinforcement than the fusion-bonded epoxy-coated reinforcement that has been used in the United States since 1975 and also the corrosion-free design life shall be 75 to 100 years when exposed to adverse environments. The research was aimed at developing new reinforcement materials and systems that minimally damage the coating system during (1) coating application, (2) fabrication bending operations, and (3) shipment to and installation at the jobsite. It was required that alloys have superior characteristics, and that thin-clad conventional steel resist damage. The coating systems had to have superior physical and chemical properties that remain undamaged by long-term exposure to ultraviolet radiation, high temperatures, salt-laden atmosphere, and other environmental conditions during long-term storage before casting them in concrete. On March 3, 1993, 3M informed the researchers that Scotchkote 213 (3M 213TM ) would no longer be manufactured, because of rulings from the U.S. Environmental Protection Agency (EPA). The 3M 213 epoxy-coated bars had been used almost exclusively in the bridges in the United States from about 1980 to 1990. Based on this change, it became crucial to secure bars coated with the 3M 213 for the in-concrete tests that were to begin in 1995. An invitational letter for submitting candidate bars was sent to 46 companies on May 17 and 18, 1993. It was anticipated that numerous new candidate organic coatings would be submitted for testing, because the 3M 213 epoxy coating material was no longer available, and new steel surface pretreatments used before coating the bars were being considered. As a result, researchers used a 30-day prescreening test program to screen these numerous organic-coated candidate bar systems, with and without special steel surface pretreatments. At that time, the organic coaters agreed that pretreatment would improve coating adhesion strength and long-term performance. The 1993–1998 research program involved testing more than 52 different organic, inorganic, ceramic, and metallic coatings on steel bars, as well as solid metallic bars. Specifically, they included epoxy-coated, other polymer-coated, ceramic-coated, galvanized-clad, epoxy-coated galvanized-clad, stainless steel-clad, nickel-clad, copper-clad, corrosion resistance alloy-clad, inorganic silicate-clad, solid corrosion-resistance alloy steel, solid aluminum-bronze, solid stainless steels, and solid titanium reinforcing bars. Prescreening tests on organic-coated bars were conducted from 1993 to 1995. These screening tests are chronicled in two reports: The Performance of Bendable and Nonbendable Organic Coatings for Reinforcing Bars in Solution and Cathodic Disbondment Tests  and the related phase II screening test report. Screening tests were also conducted from 1993 to 1995 on metallic-clad and solid metallic bars. This research studied 10 types of metal clad bars and 10 types of solid metal bars. The performance of various inorganic-, ceramic-, and metallic-clad bars and solid corrosion-resistant bars is discussed in the 1996 FHWA report, The Corrosion Performance of Inorganic-, Ceramic-, and Metallic-Clad Reinforcing Bars and Solid Metallic Reinforcing Bars in Accelerated Screening Tests. Based on screening tests as detailed in the three reports mentioned above, 12 bar types were selected for the 96-week in-concrete testing. The 141 reinforced concrete slab specimens using 12 different bar types were made and were exposed to the 96-week SE testing. These tests were completed in late 1997, and the final report was published in a 1998 FHWA report, Corrosion Evaluation of Epoxy-Coated, Metallic-Clad and Solid Metallic Reinforcing Bars in Concrete. Cyclic wetting and drying of 3-day drying at 38 oC (100 oF) and 60–80 percent relative humidity (RH, followed by 4-day ponding under a 15 percent NaCl solution at 16–27 oC (60–80 oF) for 12 weeks. Continuous ponding under a 15 percent NaCl solution at 16–27 oC (60–80 oF) and 60–80 percent RH for another 12 weeks. The 15 percent salt solution was chosen to represent the high salt concentrations occurring on inland bridge structures from deicing salts. The long ponding period was utilized to simulate a sustained period of submersion or long periods of high concrete moisture common in winter months or in marine structures. This 24-week cycle was repeated four times for a total test period of 96 weeks. Configuration of the concrete slabs used in this FHWA study measured 30.5 x 30.5 x 17.8 centimeters (cm) (12 x 12 x 7 inches) and contained two layers of 29.2-cm (11.5-inch) long and 1.6-cm (5/8-inch) diameter reinforcement, as shown in figure 1. 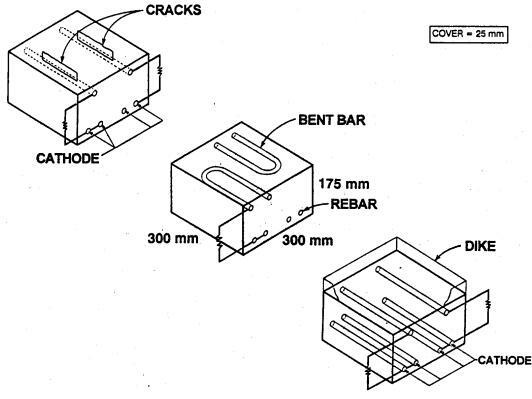 The top mat acted as a macroanode and contained either two straight or two bent reinforcing bars, while the bottom mat was a macrocathode that contained four straight reinforcing bars. The top mat bar was connected to two bottom mat bars through a 10Wresistor. A clear cover of 25.4 millimeters (mm) (1.0 inch) was used in all specimens. This cover conforms to either the American Association of State Highway and Transportation Officials- (AASHTO) specified bottom-of-slab cover, or possible minimum in-place clear cover, allowing for construction tolerances when 3.8- to 5.0-cm (1.5- to 2.0-inch) cover requirements are specified. While most previous published corrosion studies used only crack-free concrete slabs, some of the test slabs used in this project contained the cracks directly over a top mat rebar to simulate cracks observed on actual bridge decks. Table 1 presents the concrete mix design data for the test slab concrete. Table 2 shows the chloride concentration data collected during the 96-week FHWA study, and figure 2 shows the estimated chloride concentration at the top mat depth (2.5 cm or 1.0 inch) with time. It is clear that rapid migration of chloride is achieved through the SE testing. At the sixth week of testing, chloride concentration at the 2.5 cm (1.0 inch) depth exceeded2.97 kg/m3 (5 pounds (lb)/yard (yd)3) (0.137 percent or 1,370 parts per million (ppm)), which was greater than 3 times the known chloride threshold (0.71 to 0.89 kg/m3 (1.2 to1.5 lb/yd3) or 300 to 350 ppm) for uncoated American Society for Testing and Materials (ASTM) A615 bar. Table 3 summarizes the performance data of seven different rebar materials tested under the 96-week FHWA test program. Figures 3 and 4 show average macrocell current and mat-to-mat AC resistance data of each type reinforcing bar in table 3. Furthermore, table 4 classifies average macrocell current and mat-to-mat AC resistance of the ECR slabs for each coating type. The 96-week FHWA study concluded that the best ECR performance was obtained when the bars were tested in a straight condition, with 0.004 percent damage in uncracked concrete using an ECR cathode in the bottom mat. Researchers also found that there was a clear relationship between the mat-to-mat resistance values of the ECRs and their corrosion performance. Better corrosion protection was provided by those coating systems that had high electrical resistance, that is, the corrosion was strongly dependent on the amount of damage in the coating.